What can be done to promote multilingualism in the work of the United Nations? How would it make the UN more effective? These were questions raised at a recent symposium on multilingualism organized by the Study Group on Language and the UN. Participants agreed that the UN’s language needs extend far beyond the translation and interpretation of its six official languages, yet these needs receive insufficient attention. Nor is the multilingual potential of the UN fully realized. In a wide-ranging discussion, UN personnel, diplomats, NGOs and academics were in broad agreement that, if the UN is to realize its mission to reach out to civil society, and if it is to engage in constructive dialogue with its various publics, it needs to address its language priorities in the field and find the resources to act on these priorities. Symposium participants pointed to peacekeeping operations, UN information services, and, above all, implementation of the Sustainable Development Goals, as areas where a more systematic effort is needed to use a wide range of languages if success is to be achieved. The Symposium, convened at the UN Church Centre on May 10 and 11, 2018, opened with a panel discussion involving four ambassadors: Martin García Moritán of Argentina, Rudolph Michael Ten-Pow of Guyana, Valentin Rybakov of Belarus, and Narjess Saidane of the International Organization of La Francophonie. Moderator was Igor Shpiniov of the Department for General Assembly and Conference Management. 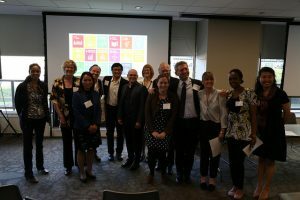 In effect representing four of the six official languages (Spanish, English, Russian, French), the four panelists discussed efforts to achieve parity among the six, emphasizing the lack of resources and the increasing demands on the language services. Keynote speaker at the symposium was Michele Gazzola, of the University of Leipzig, a specialist in the economics of language, who addressed language policy in the World Intellectual Property Organization and the European Patent Office. A more multilingual approach to patenting would help safeguard intellectual property, argued Dr. Gazzola, and thereby benefit humankind. It makes sense from both an economic and a humane perspective. The symposium was sponsored by the Center for Applied Linguistics (Washington DC), Birkbeck University of London, the Center for Research and Documentation on World Language Problems and its journal Language Problems & Language Planning, the Universal Esperanto Association, and the Esperantic Studies Foundation. More information is available at www.languageandtheun.org.